An Italian tour for the end of the year between the wine cellars of the Volcano Etna, flavours and charity organized with the coordination of the chef Pietro D’Agostino, patron of the Michelin starred restaurant ‘La Capinera’ in Taormina. It is the autumnal stop-over for the team from the Mediterranean Cooking Congress scheduled in Sicily from the 1st to the 3rd of October. The location for the welcoming is ‘Villa Neri’ on Etna, with a tour of the five stars hotel which is located on a natural terrace where there is an outstanding view of Taormina’s gulf, immersed in a context safeguarded by the National Park of Etna. Villa Neri has 24 rooms; there are 9 wine cellar suites with Jacuzzi, terraces and small private wine cellars with a red and white wine selection from the 80 farms in the area and their respective wine glasses. The restaurant of the hotel is ‘Le Dodici Fontane’, Michelin starred, where different Sicilian flavours become an unforgettable experience. For three years Elia Russo has been the executive chef of this restaurant, his maestro was Massimo Mantarro, 2 Michelin stars, chef of San Domenico Palace of Taormina. The chef Russo combines technique and innovation, using the typical Sicilian products into perfect and creative dishes. The most appreciated dishes are Carnaroli Rice with lemon and black pepper on a layer of fresh scamps, yellow tuna with creamy brulèe made of turnip’s celery, cooked wine and onions in orange’s honey and the neck of the black pork from Nebrodi cooked at low temperature with fennel, roast potatoes and chicory. 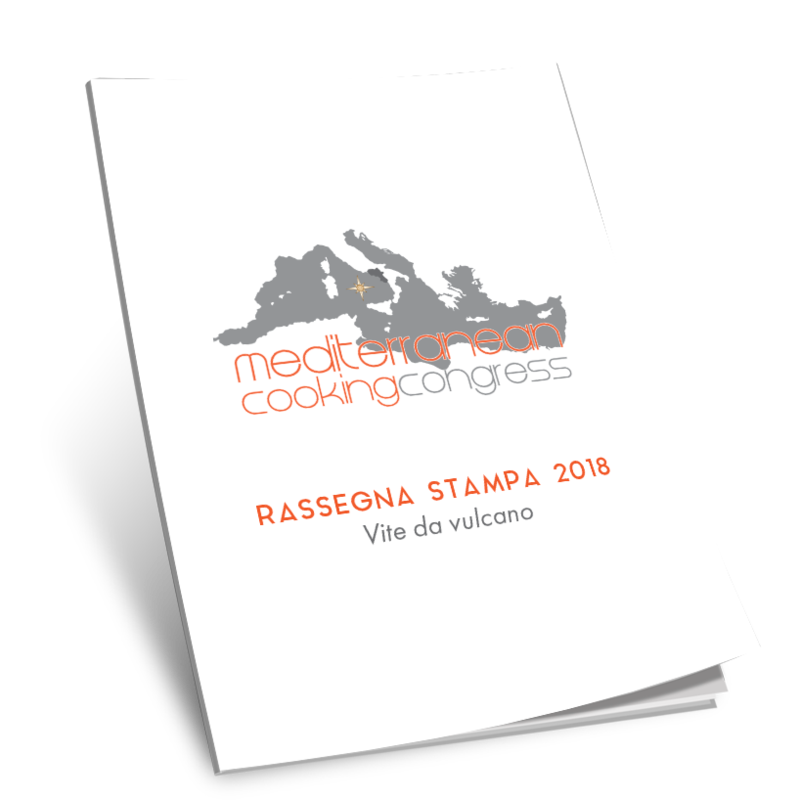 The tour in Sicily with the team from Mediterranean Cooking congress will be held on the 2nd of October, following the guide of the chef Pietro D’Agostino, patron of the restaurant ‘La Capinera’ in Taormina. During the morning there will be a meeting with the best chefs from the association Charming Italian Chef, FIC, CON.PA.IT, leaded by Pietro D’Agostino and Seby Sorbello, president of the association Cuochi Etnei and Chef Patron of the restaurant Sabit Gourmanderie of Zafferana. The meeting will start at 10am and it will be held in the beautiful wine cellar Pietradolce. The chefs will explain throughout the art of cooking the products that the farmer will bring, following the theme of sustainability and showing how the chef uses and transforms the product. During the evening, the tour will be held at Radice Pura, in Giarre close to Catania, where the “Fundraising Dinner – donating air” will be held, an important charity event where Michelin starred chefs, pastry makers, important entertainers and footballers will take part in a funny culinary competition. The panel of judges will consist of journalists. This year, the event will be directed by Gino Astorina and hosted by Ruggero Sardo with a special host from Sanremo, Giovanna D’Angì. During the B2B in the morning with the participation of producers, journalists, bloggers and influencers there will be a discussion with the chefs on the theme: “To interpret the future changes of the Sicilian and Italian cuisine in the next years”, presented by the journalist Fabrizio Carrera, director of ‘Cronache di Gusto’. Again, the main theme will be the sustainability of the products from the land. To cook consciously means to respect the raw materials, giving them value during every stage, from the production to the conservation to the transformation, throughout a perfect way of cooking that will preserve the taste and characteristic of these products. Furthermore, it means to reduce the wastage, developing inventiveness and creativity. The cooking is seen as a celebration of an ingredient. At the end of the meeting there will be the lunch.